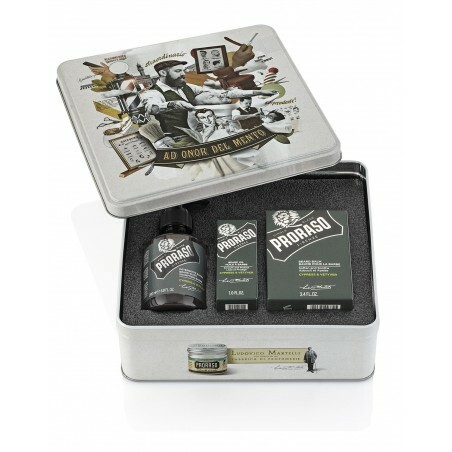 Proraso Beard Kit Cypress & Vetiver. A new collection born from the collaboration between Proraso and Nazario Graziano, an italian illustrator and collage artist. 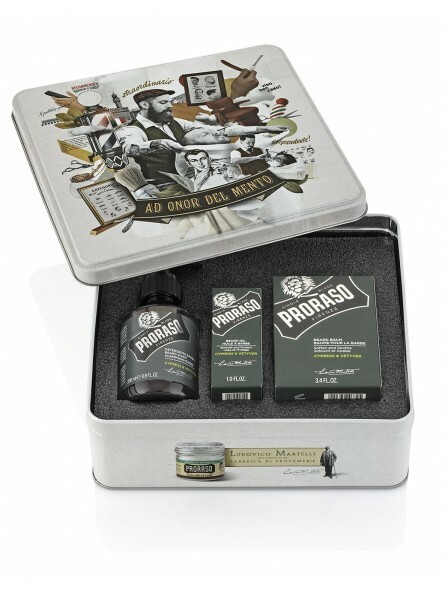 A tribute from Proraso to the world of barbers, with whom they have constructed the history of Italian shaving. The line dedicated to the expert hands of capable and precise professionals with a single lade and focussing on product quality. A line creted with rich and full-bodied texture formulations in three distinctive fragances. Items included: Beard wash 200 ml, beard balm 100 ml and beard oil 30 ml. Cypress & Vetiver: Dry, woody and warm fragance with end notes of amber. It starts with clean notes of cypress dampened by the bergamot, the heart is of vetyver and cedar for a few minutes until the notes of amber that embellish the rest of the day.